I just can’t help myself when it comes to throwing out useable cast-offs. I have a garage and basement full of stuff that I have no idea how I’m going to use, but it just seems too cool to trash. Sometimes that piece of junk ends up being the EXACT THING I need to finish a sewing or craft project, but it doesn’t reveal itself until another piece comes along to create that “Eureka!” moment. Such was the case with the bird feeder I just made. I’ve been helping my friend EJ remodel a house she just bought, and it’s been a treasure trove of cool stuff. 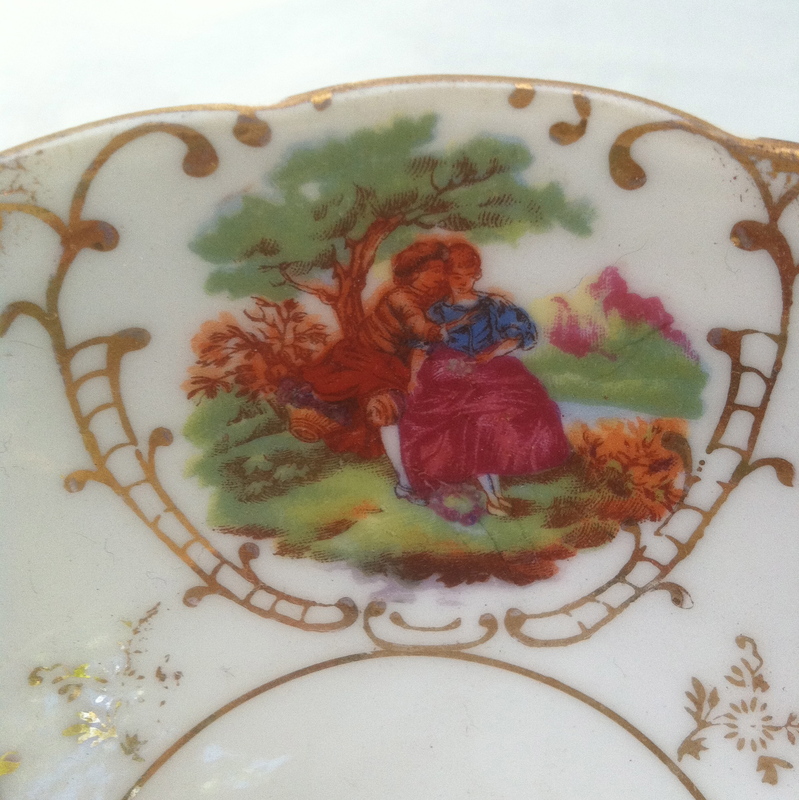 The people who moved out left TONS of crap behind – and a lot was crap – and there were a few gems I had to adopt and bring home. Among my new findings were some decorative woodworking pieces and an old lathe-turned spindle to a staircase. All they needed was for me to find the giant, over-sized vintage tea cup at a thrift store to know they were meant to be a bird feeder! Now this was one idea that I couldn’t realize without the help of my handy work friend, Marc. He’s made and/or repaired great stuff for me over the years including a shelf for my laundry sprinkler collection, bookends from old bowling trophies, and a kitchen counter to help organize the clutter of my tiny 1940s kitchen. He has awesome ideas to make things easier and more sturdy than my concepts often are, and he has access to a huge shop full of tools and equipment at our workplace, which he’s a whiz at using. So – the first thing he did was make a little platform to set the tea cup and saucer on, which would become the actual bird feeder. He trimmed the platform with some of the decorative wood pieces I had, then he attached that to the turned spindle. Although I hadn’t asked him to do it (but had thought about it), he added a metal rod to the bottom of the spindle so I could stick that part into the ground for stability. 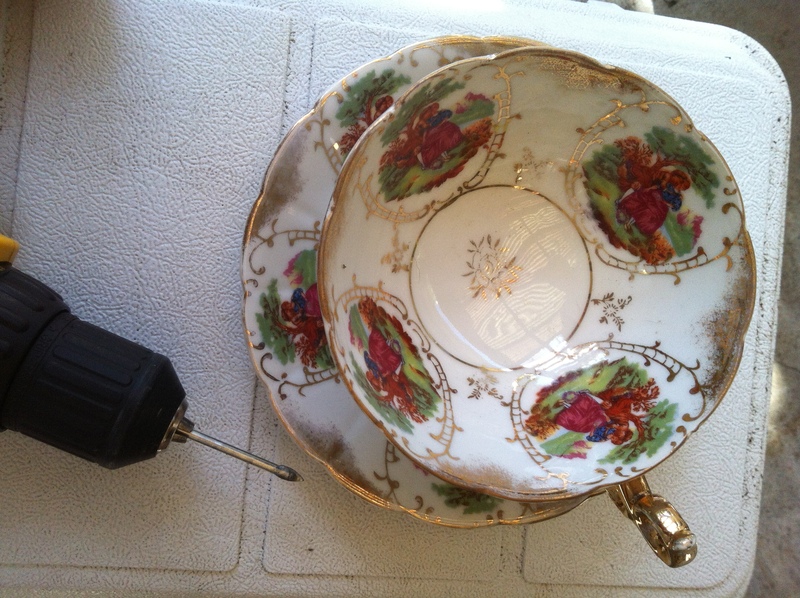 Ready to drill the cup and saucer – HARD! The next part involved the “feeder”. I really scored the day I found that oversized cup and saucer while thrifting. I mean, it’s not just large, it’s HUGE, and I’ve never seen another like it. 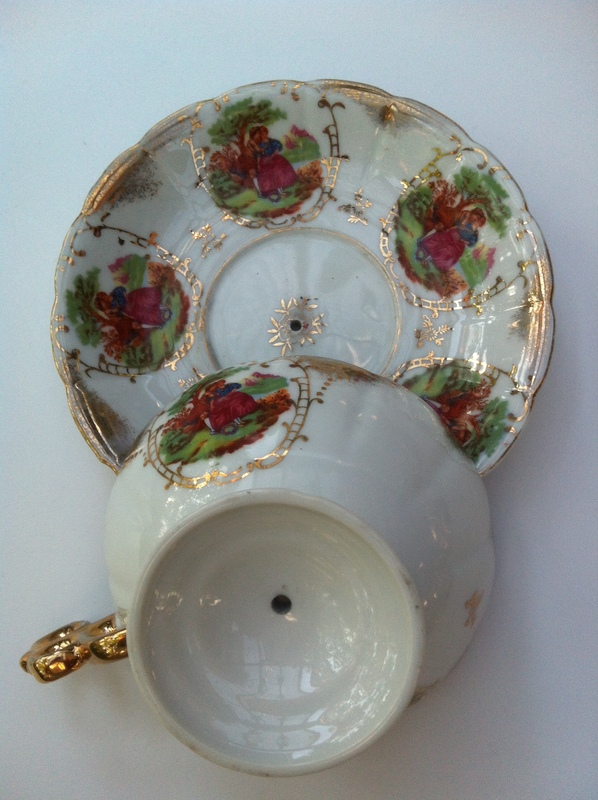 The fact that it has fancy/cheesy Rococo-style images and lots of gold trim on it make it that much better! My plan was to drill through both pieces so they could fit onto a threaded bolt inserted into the platform, then I’d hold them on with a gasket and wing nut. I wanted it to be removable so I could wash the feeder every so often. 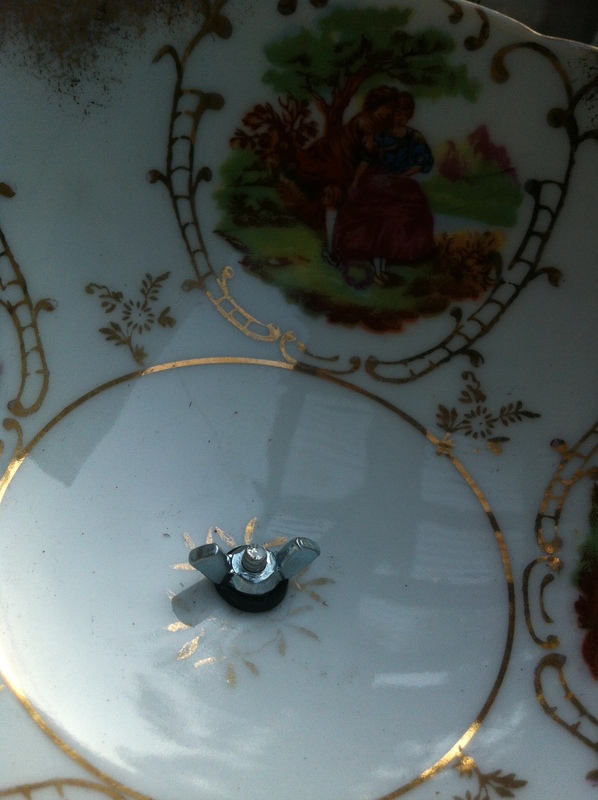 Drilling through this tea cup was WAY HARDER than I thought it would be. 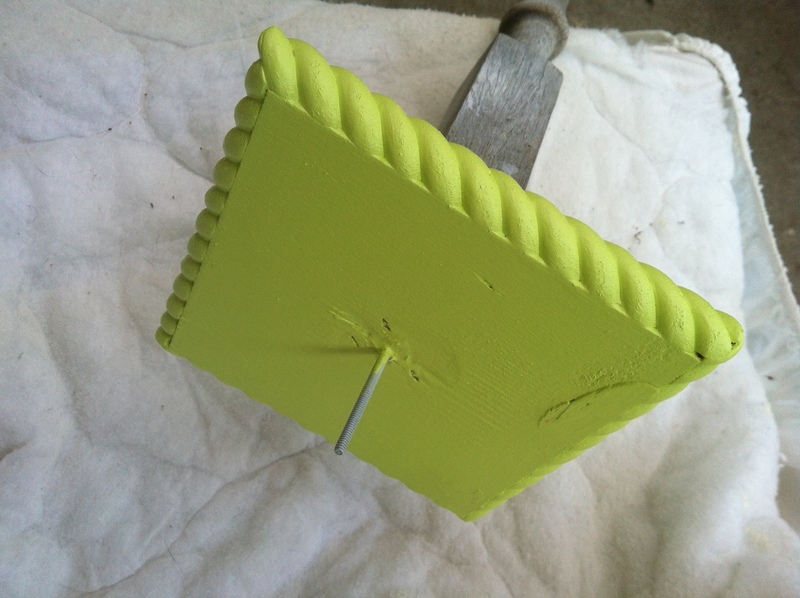 I had my special drill bit for drilling tile and glass, but the pedestal portion of the base I was drilling trough was almost 5/8″ thick and it took for-freakin’ ever. Seriously, I must have spent an hour and a half on it and several battery recharges to the drill over a couple of days. Anyway, once I got through that, I tackled the saucer, which took five minutes at the most. Finally! Felt like I should have drilled through to China for how long this took! I drilled a hole in the top of the base for the threaded bolt piece and filled it with wood glue before I inserted the bolt. I let that dry for a day, then assembled the whole thing for the first time – base, then cup and saucer on the bolt and a gasket and wing nut to hold it all on. Loving it! Now my garden is not exactly the most lush, verdant thing I’ve always hoped it would be (I used my neighbor’s yard for the picture) and I’m not entirely sure the feeder is going to be at home there – it may end up as a wedding present – but I like the way it looks among the leaves and flowers, and I hope the birds will like it too. Bring on the hungry birds! 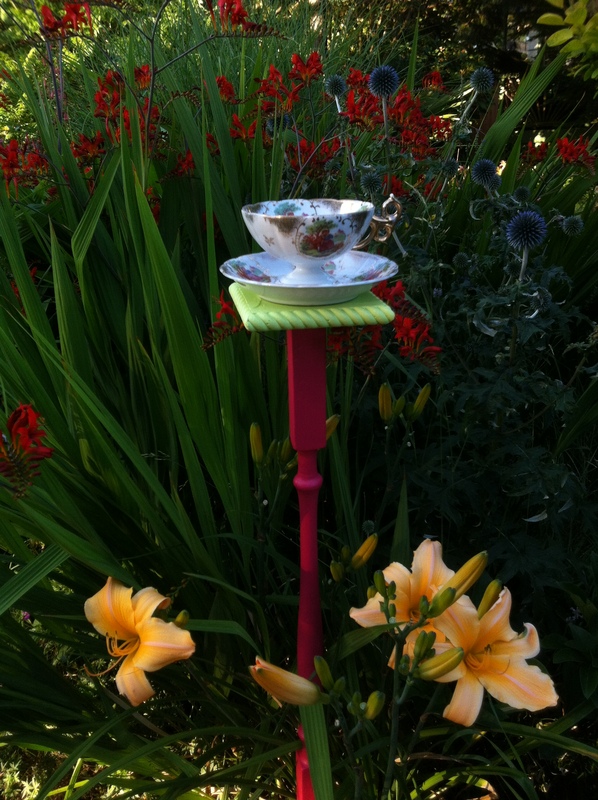 You can do this project easily – fancy tea cups and saucers are easily found at thrift stores and yard sales, and you could use any pieces of scrap wood for a stand. You might even want to make one that hangs and skip the stand part. Just get some decorative chain to attach to the base and you’re ready to hang it. I do think you’re going to want to anchor the cup and saucer to the base – if not with my method you could always glue it, but I like the ability to take it apart and wash it and maybe put it away for the winter months if there’s a chance it could freeze and crack if it ended filled with rain or snow. This entry was posted on August 6, 2013 by scootrah. It was filed under crafts, Uncategorized, woodworking and was tagged with bird feeder, cup and saucer, repurposed materials, vintage tea cup.